The "Breeding" screen is for viewing and recording the breeding of animals entered in the "Main Animal" screen. Use this screen to track all breeding activity of an animal. To add a new animal breeding to the list, click on "+ Add New", to edit click on "Edit". The actual breeding should be recorded on the day it occurs. After the animal gives birth or the eggs hatch the number of births should be recorded. For small nesting animals the count can be estimated until an actual count takes place. The survivors can be updated as necessary. If there are no births the "No Birth Failed Breeding" box should have a check mark placed in it to keep this animal from showing past due in the reports. When working with animal breeding in this system the female will be chosen to mate with the male. To do this, the female's name will be selected then the male name can be added to the breeding list. The males breeding records can be found by going to the "Main Animal" screen and clicking on the animal's name to get a detailed report about the animal including all breeding activity. Male Name (Required entry) Select the male animal's name that is being bred to the selected female. 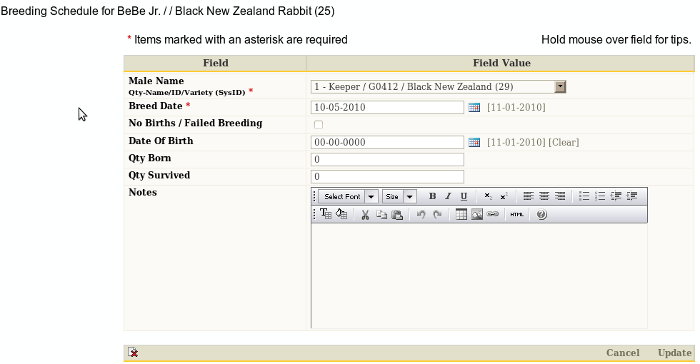 Breed Date (Required entry) Select the date the breeding occurs. No Births / Failed Breeding Place a check mark in this box if the breeding fails and there are no births. This will prevent this animal from falsely reporting past due in the breeding and summary reports. Date Of Birth Select the birth or hatch date. Qty Born Enter the total number of births the day of birth. Estimate this number if necessary and correct when known.